Adam Roynon is back in Peterborough Panthers' colours at Berwick. Photo: David Lowndes. The city racers make their second television appearance in the space of a fortnight when travelling to face a Berwick Bandits side yet to slip up at home. It means something is likely to give in front of the Sky Sports cameras on a night when victory would see Panthers return to the top of the table. They face a tough task though due to the absence of three riders. Captain Ulrich Ostergaard, red-hot Michael Palm Toft and new recruit Emil Grondal are all missing due to fixtures in their native Denmark. Newcastle man Steve Worrall and Redcar ace Adam Roynon, who had been set to race for the club on a regular basis this season until injured on the opening day of the campaign, step in with the rider replacement facility also in operation. Rathbone said: “It is an honour for the club to appear on Sky again. “Of course it is not ideal to have three riders missing, but we have drafted in a couple of very capable guests and I am confident we can give a very good account of ourselves. Berwick have won four of their five home league meetings to date. They were recently held to a draw by a Plymouth side who have also won at the Showground. They turn to a Devils man to step in at number one tonight with former Panthers ace Ryan Fisher deputising for the injured Ben Barker. 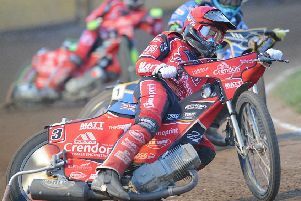 Berwick are also missing one of their two Danish riders with Claus Vissing – another ex-Peterborough man - racing in his homeland. They use the rider replacement facility to cover his absence. BERWICK: Ryan Fisher (guest), Fernando Garcia, Rider replacement for Claus Vissing, Thomas Jorgensen, Kevin Doolan, Alex Edberg, Richard Hall. PANTHERS: Steve Worrall (guest), Rider replacement for Emil Grondal, Lewis Blackbird, Adam Roynon (guest), Robert Lambert, Rafal Kopnopka, Simon Lambert. Panthers have pencilled in an additional home meeting next week. They will host fellow play-off hopefuls Sheffield at the Showground on Friday, July 17. The club had faced a five-week break without a home meeting between a Sunday success over Redcar and an August 9 visit from reigning champions Edinburgh.